The Extension Unit in the Ministry of Agriculture is under serious threat of extinction by the DLP government and its hired operatives. Notwithstanding, the urgent and critical need to revitalize the agriculture sector to ensure food security, healthy eating, increase exports, enhanced economic activities and to improve the standard of living in the farming community, the DLP government is hell bent on eradicating such a critical unit. In recent times, the Extension Unit has been faced with orchestrated challenges and yet still the staff preserved. With limited resources, Extension carried out farm registration post Hurricane Maria for the distribution of financial support from the World Bank. The funds were strategically distributed in areas supportive of the DLP government. But the pressure and criticism were directed at the Extension unit and not the DLP operatives who politically butchered the original bonafide list of farmers. 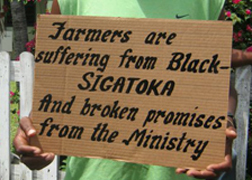 Despite, the calculated mischief by DLP operatives and the deafening silence of senior administrators within the Ministry of Agriculture, the Officers completed hundreds of complaint forms made by the farmers because of the crookedness of the DLP government with the $18 million. Imagine Officers are not aware of fertilizers given to DLP cronies to distribute to supporters and not farmers. There is a constant bashing of extension officers by ministers and operatives like, Kervin Stephenson and Reggie Saverin from the PM’s office. It is public knowledge that at a meeting held at the housing conference room with senior agricultural officials to include the Permanent Secretary, Dr. Reginald Thomas there was an outburst from Reggie Saverin who resort to indecent language. Mr. Saverin outburst was in response to sound, technical advice from the plant quarantine officer, Mr. Nelson Laville. At another meeting at the Division of Agriculture conference room, Mr. Savrien was annoyed by questions and comments posed by Mr. Franklyn Magloire, Team Leader for the West Agriculture Region and Saverin virtually open the door and asked Magloire to leave. There have been many threats about getting rid of Agricultural extension but this is delayed pending the results of the upcoming general elections. The DLP government in on the verge of closing the Agriculture offices for the West Region located in Salisbury and the Central location at the DBMC building in Goodwill. They are so deceitful, officers are being contacted one by one and asked where they would like to work. PS Reginald Thomas has even issued threats to officers saying that they will be penalized if they express themselves about the wrong that is going on. Some officers are so frustrated and are seeking alternative employment. What type of government treats its extension officers in such an unappreciative, arrogant and condescending manner and expect them to produce? The Extensionists are battling tremendous marginalization from within. Imagine, officers who are not appointed do not receive a travelling allowance and appointed officers only get travelling allowances for a limited mileage of 200 to 240 miles monthly. But with all the transportation deficiency in the Unit, the limited vehicles in the ministry were hijacked by the DLP operatives. The former Minister of Agriculture, Hon. Johnson Drigo left the Ministry several months ago but still has the vehicle received under Banana Accompanying Measures (BAM) funding. Nicholls Esprit, the political DLP misfit who was installed in the MOA was given a new vehicle under BAM to do the DLP’s dirty work and recently he was given a brand new white double cab. All this, when the Extension Unit is struggling for vehicles to do their work in the country’s economic interest. Whatever will affect the current structure of extension will affect service to the farmers. Regional and subregional extensionists remain united and committed but can not continue to remain silent about the wrongs destroying agriculture. The new minister of Agriculture, Hon. Reggie Austrie,promised sweeping changes. Let us wait and see, if it is not his usual hot air. How the DLP government can be so blatant in their further demise of the very important Agriculture industry? This vicious attack on the Extension Unit should not be tolerated by any right thinking Dominican. Agriculture built Dominica and will continue to play a very important role in the survival of Rural Dominica. For the officers in the Extension Unit within the Ministry of Agriculture to properly execute their functions towards the overall advancement of Agriculture in Dominica, there must be; formal and continuous training of officers, well equipped regional offices, adequate remunerations, method & result demonstration plots, proper transportation or access to transportation and most importantly, the complete weeding out of political operatives in the MOA who are geared at destroying the Extension Unit.